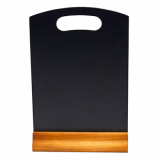 The hand held orange menu board is perfect for presenting your specials board, wine list or displaying notices. This portable board features a carry handle and redwood base for placing on the bar or table top. Suitable for use with chalk or liquid chalk pens. Hand held A4 size notice board.